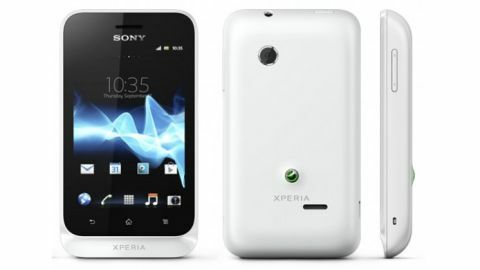 The Sony Xperia Tipo is the latest addition to the Xperia smartphone range, and it's undoubtedly the baby of the family. It comes in at around £100 (around $160), with an 800MHz single-core processor, 512MB of RAM, 2.5GB of internal storage, a 3.2MP camera and a 3.2-inch 320 x 480 display. It runs Android 4.0 Ice Cream Sandwich, which in terms of its specifications is definitely the standout feature. The Sony Xperia Tipo (also known as the ST21i) is priced at around the same level as the Huawei Ascend G300, Samsung Galaxy Y and LG Optimus L3. In other words, it's an entry-level Android smartphone. But while its specs are mostly the same as its competitors - or even slightly weaker in some cases - it is one of very few handsets at around this price point that currently runs Android 4.0. The first thing that hits you with the Sony Xperia Tipo is just how chunky it is, at 13mm (0.5 inches) thick. Conversely, its height of 103mm (4 inches) and width of 57mm (2.2 inches) are both on the small side, as you'd expect from a low-end phone. The build quality isn't bad, though at 99.4g (0.22lbs) it's pretty lightweight. Rather than sporting a plastic back like most of its rivals, the Sony Xperia Tipo comes with a "premium rubber" coating on the battery cover. This is designed to wipe clean with a wet cloth, keeping your phone looking new and unmarked. Though we didn't want to push our luck too much, these claims seemed true in our tests, with minor stains wiping straight off. The coating also makes it easy to get a solid grip on the handset. Shiny plastic covers have a tendency to feel precariously slippery in the hand, but this has no such problems. The cover is quite easy to remove, which is just as well because the battery, SIM card and microSD card slot all lie behind it. There's a small groove at the bottom of the phone that you can use to pull it straight off, and replacing it is just as easy. The microSD card slot and SIM card can only be accessed by removing the battery itself. It's an unfortunate placement, particularly in the case of the microSD card slot, since that 2.5GB of internal storage will quickly get eaten up. Heavy users of media and apps may find the need for more than one microSD card to store all of their stuff. So it would be nice if they were switchable on the fly. Still, it can take cards of up to 32GB, which will likely be more than enough for most users. The top-left corner of the Sony Xperia Tipo houses the power key, which can also be tapped to lock or wake the phone. Along from that on the top-right you'll find a 3.5mm headphone jack. On the right edge of the handset near the top there's a volume rocker, which can also be used to zoom the camera. There's also a strap hole near the bottom. On the left-hand side all you'll find is a micro USB slot, which is used primarily for charging the phone and connecting it to a computer. It's not an ideal position, since it gets in the way and makes it unnecessarily awkward to operate the phone while it's charging. A better position would have been the top or bottom edge. It also doesn't help that the charging cable provided with the phone is very short. The camera lens is on the back of the phone, as you'd expect, as is a speaker. Finally, the front of the phone has the ear speaker at the top and three soft touch keys at the bottom. These are specifically the back key on the left, the home key in the centre and the menu key on the right. The Xperia Tipo sits alongside other Android smartphones in the growing Xperia range, including the Sony Xperia Go, Sony Xperia T, Sony Xperia J and Sony Xperia V.